mvLynx 2SQL | FusionWare Integration Corp. Rapid, high speed data warehouse, data mart, data migration or data integration for MultiValue. FusionWare mvLynx 2SQL optionally creates the SQL tables that match the single values, multivalues and subvalues that make up your MultiValue data, and then exports this data. FusionWare mvLynx 2SQL is not a store and forward approach. It does not require you to make a "normalized" copy of your data first. FusionWare mvLynx 2SQL was designed for use with complex, multi-value and sub-value data by automatically normalizing the data as it passes to a SQL application. This is achieved by not only constructing the primary table, but also the associated multi-value and sub-value tables. This eliminates the need to use the traditional method of flattening the file data before exporting, thus preserving the original data structure. FusionWare mvLynx automatically creates all the correct data definitions in the SQL tables. SQL Azure, DB2 on IBM SmartCloud Enterprise, and MySQL or Oracle on Amazon RDS! FusionWare mvLynx 2SQL sports an easy to use interface where everything you need is in one place. Quickly define your transfer parameters and start executing quickly and reliably. You can access your MultiValue dictionaries using the DictCall ItemProc routine, which is similar to simple LIST/SORT syntax, access the output of basic programs or TCL commands, or write subroutines to return data. We fully support SQL Azure, DB2 on IBM SmartCloud Enterprise, and MySQL or Oracle on Amazon RDS and we are validated Ready For IBM SmartCloud Services. Most MultiValue databases including: uniVerse,™ UniData,™ mvBase,™ Northgate Reality,™ jBase,™ mvEnterprise,™ D3,™ Advanced Pick,™ and more. Data Access Server – required for each MultiValue host computer. Direct Data Access Server— high-performance, low footprint server that provides access to data and logic on your MultiValue database. Supports OLEDB, JDA (Java) and ADO.NET. dbLynx 2SQL Designer – Used to define the data that will be pulled from the MultiValue data source. Direct Designer – using our unique automap feature, quickly and easily map MultiValue data as MultiValue data, providing the metadata that Windows applications require in order to accurately and efficiently work with your data and logic. dbLynx SQL2 Command - Used to run the transfer definitions created by the dbLynx 2SQL Designer from a command line, as part of a batch file, or from a scheduler. mvLynx Managed Provider - A 100% Managed Provider for MultiValue Databases. Utilizes standards based OLE DB technology that provides much faster data extractions than traditional ODBC driver methods. 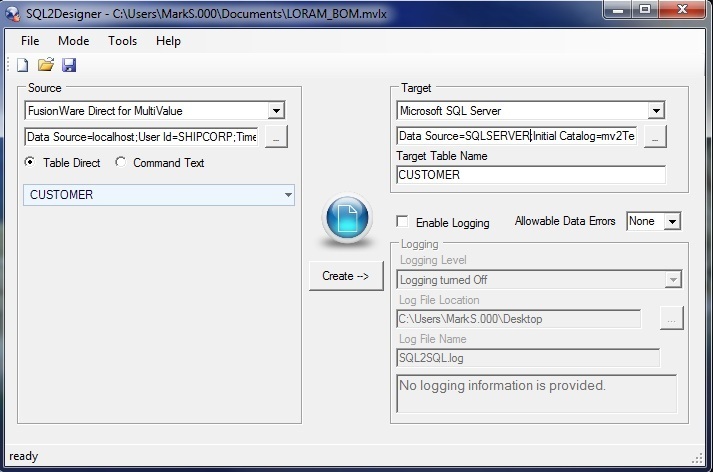 Works in conjunction with Direct Designer OLE DB to map your MultiValue data. Export MultiValue data directly to SQL Server, Oracle, DB2, Progress OpenEdge, or mySQL. Incorporates the ability to use SQL Server Agent to trigger an export of MultiValue data into SQL database with saved templates. Microsoft Task Scheduler can also be used. Any host procedure, TCL statement or file that is requested can have the output sent to SQL. Complete MultiValue data structure handled, including multi-values and subvalues. See more mvLynx videos here.